The charming and romantic town of Ravenna, in northern Italy, is not one of Italy´s most obvious destinations for tourism and appeals greatly to all our students who are looking to discover the Italian culture in greater depth, who have a special interest in art, or who wish to understand more about heritage and history, in one of Italy´s most Italian cities! Ravenna is home to a unique collection of 5th and 6th Century mosaics and eight UNESCO World Heritage monuments. Despite the city´s traditional and well-kept Italian atmosphere, Ravenna is linked to the Adriatic coast, which is one of the most popular holiday destinations in Europe! You can discover beautiful sandy beaches and magnificent nature reserves in your free time. You will have the opportunity to take part in all kinds of leisure activities, water sports, or to simply relax and enjoy the coast and the surroundings. 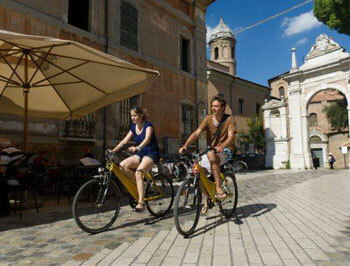 Ravenna itself offers visitors a captivating, small town ambience, with winding alleyways, cosy bookshops, hidden street cafes and a pedestrianised old town, making it a paradise for strolling around, cycling or soaking up the history. From the train station in Ravenna you can easily reach Bologna and Rimini. The town is also close to Florence and Venice, which can be reached in less than 2 hours. Our language centre in Ravenna, authorised by the Italian Ministry of Education, is a renovated school in a nineteenth Century building. There are modern audiovisual facilities in all of the classrooms, in addition to air conditioning, reading room, library and coffee area. There are computers available for students to use and free WiFi access. The school´s highly qualified, motivated tutors use modern, integrated teaching methods and a wide variety of authentic learning materials to ensure that you receive the highest quality of teaching. 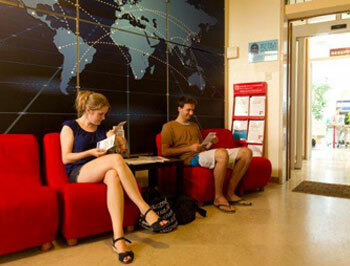 Their goal is to help you to develop your Italian language skills efficiently and with confidence. You can choose an Intensive course, consisting of 20 group Italian lessons per week in small classes, of just 8 students maximum. Each lesson is 55 minutes in duration. This programme is available to students of all levels of Italian and covers all aspects of the language. In order to combine the advantages of small group tuition, with the benefits of one-to-one classes for your specific language needs, then you could opt for an Intensive group course with 2 or 4 private lessons per week in the afternoons.The individual lessons are tailor-made and will enable you to focus on any particular areas of interest or difficulty in greater depth. If you would like to book a course of Private Italian lessons only, then you can design your own programme in accordance with your specific needs and requirements and in collaboration with your tutor. The course is totally flexible with regards to the hours, the course content and the dates of study. There are additional and exciting course options available at our school in Ravenna, for durations of 1 or 2 weeks, in Italian Cooking or Wine Tasting! These extra classes are available in combination with an Intensive language course of 20 lessons per week. 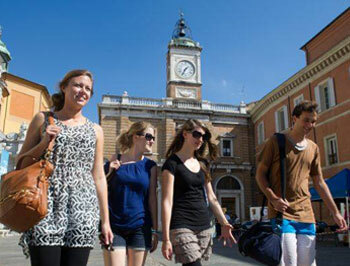 Student accommodation in Ravenna is selected with great care and attention so that you will feel comfortable and at home during your stay in Italy! You can choose to stay in a self-catering, shared student apartment, with shared kitchen and bathroom facilities, or in a private studio apartment where you will have your own private facilities. Please note that shared rooms in the shared and private apartments are only available to 2 students who are travelling together. You can choose to stay with a carefully selected Italian host family, where breakfast or half-board is included. Shared rooms are only for 2 students who are travelling together. You can book an executive host family for a larger and more comfortable room, with private bathroom included. Students who stay with an Italian host family tend to learn Italian at a faster pace, as they have more chance to practise their language skills outside of the classroom, with native speakers! If you are interested in booking hotel or bed & breakfast accommodation in Ravenna, please contact us with details of your requirements and we will do all we can to find suitable options for you. Cultural activities play an important role at the school, with an aim to help all students improve their Italian language skills and their confidence as much as possible with practise and to thoroughly enjoy their stay in Italy at the same time! On your first day at our school you will receive full details of the bi-weekly, optional activities programme and there are otherwise many more leisure possibilities in and around the town for you to explore as you wish. The school frequently organises events such as guided tours of the town, welcome drinks, a dinner in a pizzaria with a view over the sea front, a meal in a typical “Romagnola trattoria”; Italian film evenings and short seminars at the school, wine tastings, sampling typical Italian delicatessens, cookery classes and a wide variety of beach sports. You can also go skydiving, horse-riding, kite-surfing and cycling in places nearby Ravenna. Fly to Forlì, Rimini or Bologna airport. A 1-way transfer can be arranged on your arrival, however, this is not included in the course fees. There were only two students in my class and that was good in terms of attention from the teacher but not so good socially. My accommodation couldn't have been more convenient; five minutes from the school and central Ravenna. It was a beautiful house and the hostess was friendly and accommodating.